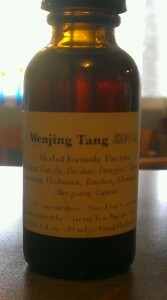 Wen Jing Tang, you were my first. 18 years ago in the office of my first acupuncturist, with a muscle test you came into my life. An insignificant looking bottle of strange spicy herbal goodness, you managed my PMS and my migraines. Acupuncture school came, and with the advice of a sea of interns and supervisors I strayed from your embrace. 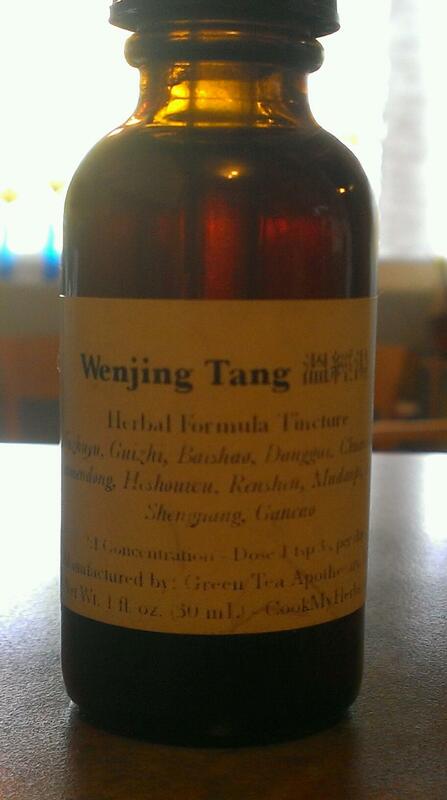 Xiao Yao San was the formula of choice for my blood and qi deficient body with stagnation I was told. And I believed. Yet, Xiao Yan San never satisfied. Its minty taste grated on my tongue and sat strangely in my belly, cramps were not relieved. Over years I have tried other herbs, yet to you I eventually return. Like an errant lover crawling back to admit my sins. PMS was replaced by hot flashes, and again I returned until curiosity and recommendations from pulse and abdomen classes led me astray once again. Xiao Chai Hu Tang, you were good for awhile but couldn’t quite compete. A fling with Zhi Shi Xie Bai Gui Zhi Tang, then back to the sweetness of your danggui and shaoyao, the moistness of your maimendong. Shen Qi Wan, I really wanted to like your fuzi heat. I was drawn to you like that bad boy standing by the juke box in leather jacket and boots with eyes of coal melting my resistance. But my gut rebelled against your intensity, and hot flashes became 100 times worse while wrapped in the tendrils of your steamy tingling embrace. So I return, tail between my legs, dripping sweat from the latest hot flash, to my old friend. Like a favorite pair of underwear you are there in your little bottle, patiently waiting for me to pick you up and smell your spicy aroma, feel your wuzhuyu and guizhi bite on my tongue. Home once again to my Wen Jing Tang. This entry was posted in Chinese Herbs. Bookmark the permalink. Lisa, I love this! And am encouraged to try your first love for my hot flashes (if thats ok with you!) lol! Also, i wanted to let you know, that i eventually stopped eating gluten – even though you advised me to do so when i saw you 4 years ago! All i can say is – I wish Id taken your advice sooner! Soraya, So great to hear from you!! If your pulse fits, by all means try my favorite formula 🙂 I’d love to hear how school is going for you, and what has happened in your life over the last 4 years. Can’t believe it has been that long…Feel free to email/text/call me if you prefer to “chat” in a more private forum. All my contact info is still the same.